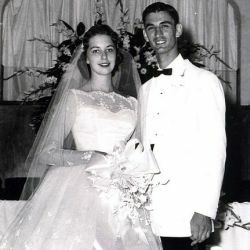 August 30: Millard and Linda Fuller marry in Alberta Baptist Church in Tuscaloosa, Ala.
Millard and Linda become millionaires from business ventures with Morris Dees (who later founded The Southern Poverty Law Center). Millard and Linda Fuller turn away from their millionaire lifestyle and rededicate their lives to serving God. They make their first visit to Koinonia Farm, just outside Americus, Ga.
Millard and Linda spend six weeks doing missionary work in five African countries. The Fullers move to Koinonia Farm to work with Clarence and Florence Jordan. They begin work on a new project — Koinonia Partnership Housing. The “Fund for Humanity” is created. The first Partnership house is completed. Bo and Emma Johnson become first-time homeowners. Dr. Clarence Jordan, founder of Koinonia, dies suddenly. Twenty-seven Partnership Houses completed at Koinonia. January: The Fullers are called to the mission field in Africa by the Christian Church (Disciples of Christ). They see it as an opportunity to expand Partnership Housing and The Fund for Humanity. The Fullers live in Mbandaka, Zaire (Democratic Republic of Congo) until 1976. August: After three years spent building more than 100 houses, the Fuller family returns to Koinonia Farm. September: Habitat for Humanity is formed. The first meeting took place in an old converted chicken barn at Koinonia Farm.